KABUL — Among the throngs of inmates in downtown Kabul’s prison trying to prove they are not thieves or insurgents is a soft-spoken Sikh man with piercing black eyes. He is being held on a highly unusual charge: falsely claiming Afghan citizenship.Baljit Singh, 23, says he was born in Afghanistan but that his family fled religious persecution when he was 5. 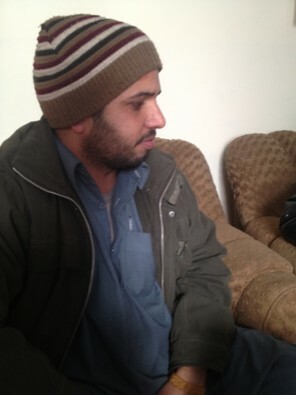 He returned to his native country on July 6, 2010, aboard a British chartered plane transporting Afghan deportees, and he has been locked up ever since by authorities who say he isn’t Afghan. Singh’s ordeal offers a disturbing glimpse into the type of religious intolerance that has made Afghan Sikhs a vanishing segment of society. His case also casts a condemning light on a justice system that could take on significantly more responsibility as the United States transitions authority in Afghanistan to the government of President Hamid Karzai.Promoting religious tolerance was one of the goals that the United States and its allies set in Afghanistan after the Taliban government was toppled a decade ago. But religious minorities, who make up about 1 percent of the population, are still routinely ostracized here. Sikhs, who follow a monotheistic religion founded in the 15th century, once constituted a large, prosperous part of Afghan society. In recent decades, as the country has become more religiously conservative, they have been harassed and disparaged as statue-worshipping infidels. They have moved en masse to India and other countries, and community leaders say there are now no more than a few hundred or at best a few thousand Sikhs left in Afghanistan. Life for Sikhs there has become especially hard in recent years, according to community leader Awtar Singh, a former lawmaker. Thousands had their property stolen during the civil wars of the 1990s. Job prospects are bleak outside of Sikh enclaves. And the government refuses to let Sikhs open cremation facilities, barring them from following an important religious tradition. Amid ferocious battles among various Afghan militant factions in the mid-1990s, Singh’s mother and stepfather left their home in Jalalabad, in eastern Afghanistan, and moved to Pakistan. The family spent the first few years of exile in Pakistan, Bahrain and Egypt, he said. When Singh was in his late teens, they were smuggled into Austria, where the family applied for asylum. Feeling restless because the claim was taking a long time to handle, Singh said he traveled to Britain, hoping that the asylum process there would be easier and quicker. He turned himself over to immigration officials hours after entering the country in January 2007, he said. During the three years Singh spent in Britain waiting for his case to be processed, he worked menial jobs and became engaged to a British woman. He said lawyers who handled his asylum case made procedural mistakes that led to his deportation. A letter from the U.K. Border Agency informing Singh of his impending removal says his case was turned down because evidence supporting the claim had been submitted in a form that “did not comply with the instructions.”When Singh arrived in Afghanistan in July 2010, along with dozens of other deportees, Afghan authorities took notice of the type of turban he was wearing — which is different from the ones worn by Afghan Muslims — and took him into custody. The other men were released. Nazari said the government plans to keep Singh in custody until the British government takes him back or another nation certifies that he is its citizen. A spokesman for the British Embassy in Kabul said the government does not generally discuss specific cases, but he suggested that British officials do not doubt Singh is Afghan. Kimberley Motley, an American lawyer who represents Singh, said the British government failed to get him an Afghan passport or other travel document that ascertained his nationality, as is customary in deportation cases. Singh said he was mistreated almost immediately after his arrival in Afghanistan. One day, fellow inmates forcibly removed his turban and demanded that he convert to Islam by uttering a few phrases. Singh said he appealed to prison guards for help. Under duress, Singh said, he nominally converted to Islam, which prompted fellow inmates to hoist him on their shoulders and parade him around the facility. Nazari, the deputy attorney general, said he had seen no evidence to substantiate Singh’s allegations of mistreatment. He said non-Muslims in Afghan custody routinely convert to Islam, hoping to get leniency. “These foreigners think if they convert to Islam, they will be forgiven,” he said. Motley, the lawyer, said Singh’s best shot at freedom is finding a country that will accept him as a refugee, although so far none has stepped forward. “Unless he has a plane ticket and someone willing to help him, the Afghans have made it clear they are not going to let him go,” Motley said. New Delhi, Jan.16 2012 (ANI): Gauri Gill, a professional photographer based in New Delhi, portrays the variance between Afghanistan before the Soviet invasion and the existing war-ravaged nation through her lens. The photographer, who traveled to Afghanistan in 2007 to conduct a photography workshop, took time off to capture the beautiful landscapes, the people and religious places like Sikh temples, also called gurudwaras in the country. On returning to India, she got in touch with the Afghani Sikh and Hindu communities who were displaced from Kabul to Delhi during the Soviet invasion in 1970s. She met with an Afghan driver in New Delhi who described Afghanistan as an altogether different land, a nation of extraordinary beauty. “He described a place with gardens, orchard, mountains, almonds, peaches and waterfalls. I mean a place which is a complete paradise,” said Gauri. Winner of Canada’s Grange Prize for Photography, the 40-year-old photographer has traveled the world over to understand the different lines of pursuit and disorientation of individuals from their roots. Gauri also exhibited her work on Afghan Sikh and Hindu migrants at Green Cardamom Gallery in London. The exhibit titled ‘What Remains’ looks at the displacement of the Afghani Sikh and Hindu communities from Kabul to Delhi, over successive waves of migration, to question notions of identity, home and belonging. دکتورسید مخدوم رهین وزیراطلاعات وفرهنگ امروز در محفلی دریافت جایزه شجاعت و محو خشونت را به خانم انار کلی هنریار تبریک گفت. خانم انار کلی هنریار از جمله فعالان حقوق بشر در کشور است و جایزه سال 2011 یونسکو مدنجیت سنگهه رابرای اولین بار درتاریخ کشور به دست آورده است. به گزارش خبر نگار آژانس اطلاعاتی باختر در محفلی که به این مناسبت ازطرف وزرات اطلاعات و فرهنگ برگزار شده بود، دکتور سید مخدوم رهین صحبت کرده این پیروزی را به خانم هنریار تبریک گفت و افزود: ما باید با همه انواع خشونت از جمله خشونت علیه زن پیکار کنیم. دکتوررهین درین صحبت مختصر هرنوع خشونت را محکوم کرده، این پیروزی هنریاررابرای همه هموطنان به شمول هموطنان سکهه و هندو تبریک گفت و همچنان از شخصیت مدنجیت سنگهه سفیر حسن نیت یونسکو که خدمات انسانی او در خدمت ملت های جنوب آسیا ستایش برانگیز است یاد اوری کرده، اقدامات وی را در رشد و گسترش فرهنگ جنوب آسیا از اهمیت بسیار برخوردار دانست. درین محفل پیام مشرانو جرگه توسط عمراخان مسعودی رئیس بنیاد جنوب آسیا – بخش افغانستان خوانده شد. بعداً” خانم انارکلی صحبت کرده از وزارت اطلاعات و فرهنگ به خاطر برگزاری چنین محفل قدردانی کرده گفت که این جایزه مربوط هنریار نمی شود بل افتخار آن به تمام ملت افغانستان میرسد.